Plaid Ribbon, Pine Cones, Red Berries, Red Glitter Loops, Assortment Of Evergreens. 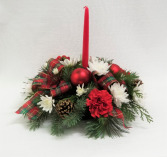 A large long centerpiece with plaid ribbon loops, pine cones, red berries, red glitter loops, and an assortment of evergreens with glass hurricane and red pillar candle. The centerpiece is approximately 34 inches long and 15 inches tall. 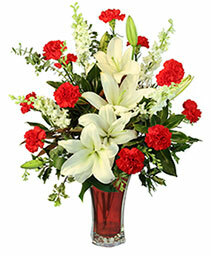 Red Mini Carnations, White Roses, White Lillies, Gold Ribbon Loops, Pine Cones, Birch Sticks, Assorted Evergreens, Gold Vase. 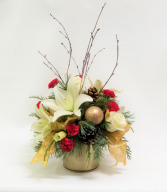 An all the way around Christmas arrangement in a gold vase with red mini carnations, white roses, white lillies, with gold ribbon loops, pine cones, birch sticks, and an assortment of evergreens. Arrangement approximately 14 inches round and 22 inches tall. Baby Green Hydrangeas, Green Button Mums, White Alstroemeria, Gold & Green Ornaments, Gold Ribbon Loops, Pine Cones, Assortment Of Evergreens. 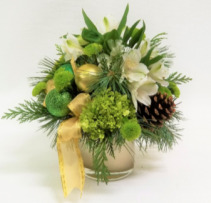 An all the way around vase winter arrangement that includes green hydrangeas, green button mums, white alstroemeria, gold ornaments, green ornaments, pine cones, gold ribbon loops and an assortment of evergreens. Arrangement size is approx. 12 inches round and 10 inches tall. 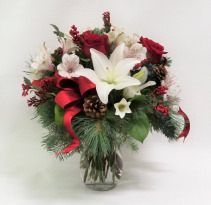 White Casa Blanca Lillies, White Roses, White Dendrobiums, White Snapdragons, White Larkspur, Plaid Ribbion, Pine Cones, Red Berries, Red Glitter Loops, Assortment Of Evergreens. A large elegant long centerpiece with white casa blanca lillies, white roses, white dendrobiums, white snapdragons, white larkspur, plaid ribbon loops, pine cones, red berries, red glitter loops, and an assortment of evergreens with glass hurricane and red pillar candle. The centerpiece is approximately 36 inches long and 15 inches tall. White Snapdragons, White Larkspur, White Hydrangeas, White China Mums, Red Roses, Pine Cones, Red & Silver Ribbon Loops, Silver Ting Ting, Assortment Of Evergreens. A Large all the way around holiday arrangement with white snapdragons, white larkspur, white hydrangeas, white china mums, red roses, pine cones, silver ting ting, ribbon loops, and an assortment of evergreens in a clear vase. The arrangement is approx. 21 inches round and 29 inches tall. 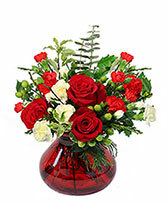 Red Roses, Large Red Carnations, White Cushion Mums, Pine Cones, Red Ribbon Loops, Red Berries, Assortment Of Evergreens. A long and low centerpiece with red roses, large red carnations, white cushion mums, red ribbon loops, pine cones, red berries, red glitter loops, and an assortment of evergreens with two taper candle. The centerpiece is approximately 22 inches long and 12 inches tall. 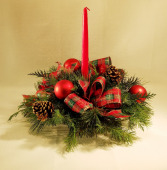 Red Berries, Pine Cones, Red Ornaments, Plaid Ribbon Loops, Assortment Of Evergreens. 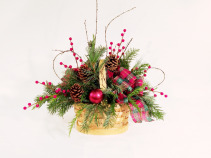 A one-sided basket arrangement of an assortment of winter evergreens with red berries, pine cones, red ornaments, and plaid ribbon loops. Basket arrangement is approx. 16 inches long and 19 inches tall. 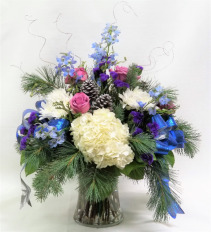 Lavender Rose, Light Blue Delphinium, Purple Statice, White Cushion Mums, White Hydrangea, Silver Pine Cones, Blue Ribbon Loops, Silver Ting Ting. A large all the way around vase holiday arrangement that includes white hydrangeas, light blue delphinium, lavender roses, purple statice, white cushion mums, silver pine cones, blue ribbon loops, silver ting ting and an assortment of evergreens. Arrangement size is approx. 21 inches round and 29 inches tall. Pine Cones, Red Ribbon Loops, Red Berries, Assortment Of Evergreens. A long and low centerpiece with red ribbon loops, pine cones, red berries, red glitter loops, and an assortment of evergreens with two taper candle. The centerpiece is approximately 22 inches long and 12 inches tall. Large Red Carnations, Red Mini Carnations, Red Ornaments, Pine Cones, Plaid Ribbon Loops. Oval centerpiece with large red carnations, red mini carnations, red ornaments, pine cones, plaid ribbon loops, and an assortment of evergreens. The centerpiece is approx. 21 inches long and 7 inches tall. 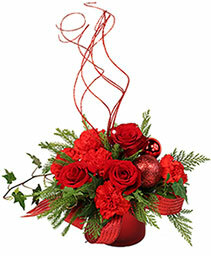 Red Rose, White Cushion Mums, Large Red Carnations, Red Ribbon Loops, Red Ornaments, Assortment Of Evergreens. 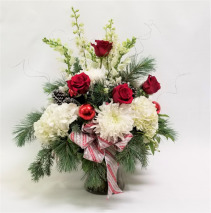 An all-around holiday bouquet with red roses, white cushion mums, large red carnations, ribbon loops, red ornaments, and an assortment of evergreens in a metal container. The bouquet is approx. 18 inches long and 8 inches. Red Carnations, White Cushion Mums, Candy Canes, Ornaments, Pine Cones, Ribbon Loops. 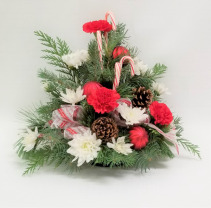 A one-sided bouquet with large red carnations, white cushion mums, candy canes, ornaments, pine cones ribbon loops, and an assortment of evergreens. The arrangement is approx. 14 inches long and 15 inches tall. Large Red Carnations, White Cushion Mums, Ribbon Loops, Ornaments, Pine Cones, Assortment Of Evergreens. A round centerpiece with an assortment of evergreens, red carnations, white cushions mums, plaid ribbon loops, ornaments, pine cones, and a taper candler. Centerpiece is 13 inches round and 13 inches tall. Red Roses, White Alstroemeria, White Lillies, Red Berries, Pine Cones, Red Ribbon Loops, Assortment Of Evergreens. 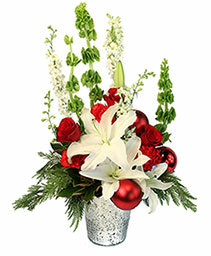 An all-around vase arrangement with red roses, white alstroemeria, white lillies, red berries, pine cones, red ribbon loops, and an assortment of evergreens in a clear vase. The arrangement is approx. 16 inches round and 18 inches tall. Gold Ornaments, Red Ribbon Loops, Pine Cones, Gold Ting Ting Loops, Assortment Of Evergreens. An all-around vase arrangement with gold ornament, red ribbon loops, gold pine cones, gold ting ting loops, and an assortment of evergreens in a red cube vase. The arrangement is approx. 12 inches round and 15 inches tall. 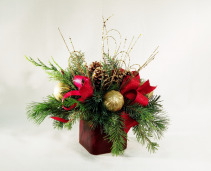 Red Roses, Queen Anne Lace, Pine Cones, Red Berries, Burlap And Red Ribbon Loops, Assortment Of Evergreens. 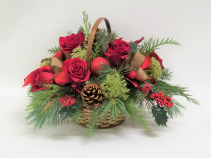 An all-round basket arrangement with red roses, Queen Anne lace, pine cones, red ornaments, red berries, burlap ribbon loops, red ribbon loops, and an assortment of evergreens. Arrangements is approx. 16 inches round and 11 inches tall. 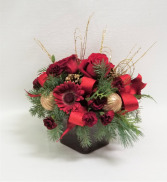 Red Roses, Red Gerbers, Redburgundy Mini Carnations, Gold Ornaments, Red Ribbon Loops, Pine Cones, Gold Ting Ting Loops, Assortment Of Evergreens. An all-around vase arrangement with red roses, red gerbers, red mini carns, gold ornaments, red ribbon loops, pine cones, gold ting ting loops, and an assortment of evergreens. The arrangement is approx. 12 inches round and 15 inches tall. Assortment Of Evergreens, Plaid Ribbon Loops, Ornaments, Pine Cones. A round centerpiece with evergreens, plaid ribbon loops, ornaments, pine cones, and a taper candle. The centerpiece is approx. 13 inches round and 13 inches tall. 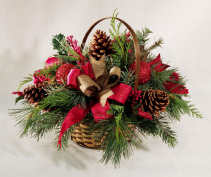 An all-round basket arrangement with pine cones, red ornaments, red berries, burlap ribbon loops, red ribbon loops, and an assortment of evergreens. Arrangements is approx. 16 inches round and 11 inches tall. Christmas flowers from CRISMON'S FLOWERS in Mesa, AZ are the best way to send Christmas cheer! Flowers and poinsettia plants are a great way to spread joy throughout the season, but also make quick and easy party decor. 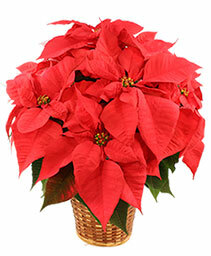 CRISMON'S FLOWERS can help you with any Christmas styles or colors with our Christmas decor accessories. Need a centerpiece or a Christmas wreath for your party? 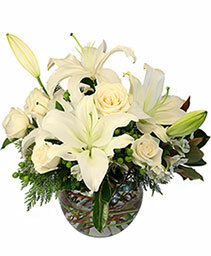 CRISMON'S FLOWERS has it, and more!